Iraq’s campaign season will come to an end Friday evening, in preparation for the voting on Sunday. But a special vote was held Thursday for certain groups, such as the military, which was marred by three bombings that left 14 persons dead. Voting begins today, Friday, among Iraqi expatriates in Jordan, Syria and 14 other countries. Since two important Shiite coalitions are competing against one another in this round, and many Sunnis appear ready to vote for a cross-sectarian secular party, it is unlikely that any party or coalition will get more than 25 percent of seats. There is therefore likely to be a long post-election period of political negotiation and horse trading, during which Prime Minister Nouri al-Maliki will effectively have his tenure extended. There might not even be a new government until August, and it may well be a government of national unity. The majority Shiites will need a partner to get to the 66% of votes required to elect a president, and the Kurds are the most likely partner. If so, the ‘new’ government may look an awfully lot like the national unity government of summer, 2006, with regard to parties represented and politicians in the cabinet, whether or not al-Maliki retains the prime ministership. That the Shiites will need the Kurds may provide an opening for the parties to resolve outstanding conflicts over the future of the northern Kirkuk oil province. The election may therefore reinforce the status quo rather than creating the kind of political instability that foreign investors fear. It seems to me extremely unlikely that the post-election scene will be so violent or unstable as to call for a revision of the current timetable for US troop withdrawal from Iraq, to which President Obama has committed the US government. Iraq has actually seen much worse violence in recent months than anything it has experienced in the run-up to this election, though it is true that civilian casualties spiked in February. Iraqi authorities have repeatedly said proudly that the Iraqi military and other security forces are capable of keeping basic peace now, and they are in charge of security for the voting stations this time, not the US military. I do not believe the Iraqi parliament that is about to be elected will put up with any foot-dragging on troop withdrawals by the US,and I think the US military officers who speak of slowing down the withdrawal are doing so to discourage radical guerrillas from making trouble during the elections (warning them that attacks will backfire by making it harder to get rid of the Americans). Al-Hayat [Life] reports in Arabic that over a million Iraqis took part in the early voting day on Thursday, including soldiers, hospital patients and others who cannot get to the polls on Sunday. The occasion was marred by three attacks that killed 14 persons and wounded dozens, two of them suicide bombings, which targeted two voting stations set aside for the security forces in the north and west of Baghdad. Half of those killed were from the security forces. Al-Hayat says that some parties expressed suspicion that Prime Minister Nouri al-Maliki of the Islamic Mission Party (Da’wa), which is the core of his State of Law coalition) would use Thursday’s vote for fraudulent purposes benefiting his party. Usamah al-Nujaifi of the Iraqi National List called on NGOs and international observers to monitor the voting closely for such fraud, since, he warned, military elements could simply be ordered (by the prime minister) to vote one way or another. An official in the Independent High Electoral Commission, Hamdiya al-Husaini, confirmed to al-Hayat that soldiers had been pressured to vote for a certain party, which she would not name, and even that some soldiers arrived at the voting station only to find that someone else had already voted on their behalf. She promised an investigation by the High Electoral Commission. The voting process was chaotic, and many soldiers’s names could not be found at their voting stations on the registration rolls. Some soldiers even staged demonstrations over being disenfranchised in this way, in response to which the the High Electoral Commission promised them redress. Nevertheless, thousands are estimated to have been unable to vote. The High Commission says that they will be allowed to vote on Sunday. Al-Hayat reports in Arabic that authorities in the southern Shiite port city of Basra have arrested a group that is printing up counterfeit rulings or fatwas attributed to Grand Ayatollah Ali Sistani of Najaf, urging Shiites to vote for a specific party. Sistani has declared his neutrality in this election, though other grand ayatollahs seem to be plumping for the National Iraqi Alliance of Shiite religious parties led by cleric Ammar al-Hakim. 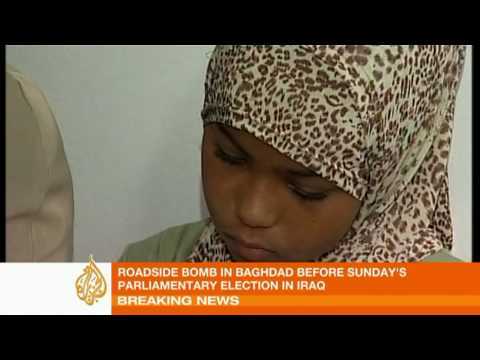 RFE/RL has video on the use of Arabic music videos and Facebook in the parliamentary campaign. .
Aljazeera English covers the campaigning, which ends Friday evening, and clearly throws its support behind the National Iraqi List, headed by former interim prime minister Iyad Allawi, which has both Shiite and Sunni secular support. This report’s assertion that this time no party or coalition can win without cross-sectarian support is not actually true, and polling suggests that Allawi’s group will only get a fifth of seats, with nearly half going again to Shiite religious parties.